Twitter, the only social network able to make a stand in front of Facebook has undergone a major change. The social network announced its first ever major face change which guarantees a multimedia experience for the 160 million user database. 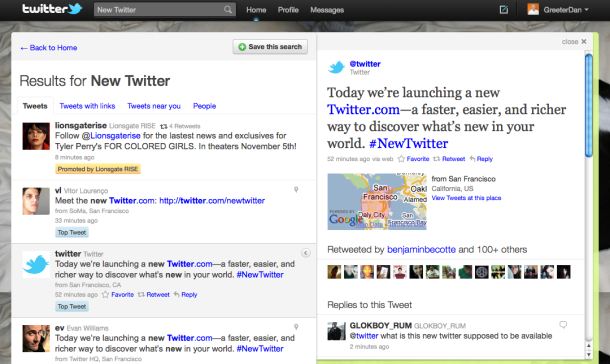 The Twitter redesign now offers information over two panes instead of one. While one panel offers 90 million messages everyday from tweets, the other features images within the text. Previously, the links to photos and videos were displayed on other websites or browser tabs. Twitter wants the users to stay on its page for long and mark a return. The redesign was only made possible after 16 photo and video sharing sites agreed to embed content on Twitter. This includes popular websites such as YouTube and Flickr which have join hands to make the social network successful. You can now take a simple short tweet and get more context and information in less time. We liked the old Twitter but we thought we could make it better. There was a lot buried underneath Twitter and now we are bringing all of that to the surface. Somewhat 370,000 new users sign up at Twitter everyday. This figure is somewhat overwhelming for the advertisers, who want to benefit the most out of the social networking site. Advertisers use the promoted tweets to sponsor tweets which show up when certain key words are used. If the redesign works out well, this would mean, more eyes more advertising opportunities. Analysts who attended the launch were pretty impressed with the new Twitter look. The termed it faster, easier and richer with a better way to explore the world.